Fox News is pushing RFID chip implants, encouraging people that the tech is safe and good for medical by stating it’s similar to getting a tetanus shot. The article then goes onto explain how awesome it is to have a chip in one’s hand, stating that those chipped can open secure doors, pay for tickets, and share emergency medical information. There is absolutely nothing safe about allowing your kids to be microchipped. All this is being prepackaged as a way for law enforcement to rescue or find lost, kidnapped and missing children. They always seek to use the children. Let me tell you, the elite care so much about the children that in the UK they wanted to lower the age of consent to four years old. I would like to know who bankrolled all these positive microchip stories. In any event, this isn’t the only way they are trying to push people to get the chip. Over the years there have been various commercials trying to push the chip. One showing a concert, another showing a doctor using it to diagnose patients’ disorders, and several other mentions of the chip in the media. However, a story this writer will never forget is about a Saudi inventor that had a “brilliant idea” to make a chip with a lethal dose of cyanide in it. Although the patent was denied in Germany, this is still an example and documentation of what can be done. Do not trust the chip. Do not even for a second trust the chip. 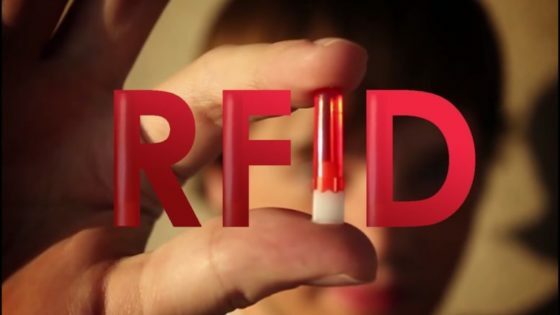 Tell the government you do not want an RFID. Let’s talk about the marketing for the RFID chip. One of the first commercials for the chip was VeriChip Corp’s extremely creepy commercial for Health Link, which shows all the health “benefits” of the microchip. However, they leave out the health risks like one of those 5 a.m. infomercials for some weight loss drug that could cause heart attacks. The chip comes with a huge risk: you’re injecting an electronic device into you that, heck, you forget has the potential of containing cyanide or another slow-killing poison. If the chip malfunctions or maybe switch is flipped after you’ve been a bad dissident against your New World Order dictatorship. IBM has also been caught pushing the RFID chip as the future market with a commercial where it seems some shady guy is stealing product, then walks out and a security guard walks up to him. “Excuse me Sir you forgot your receipt.” A female announcer then says “Checkout lines; who needs them this is the future of e-business.” First let me bash the commercial’s logic, where is this guy putting all the product he’s stealing? Is that coat of his an endless black hole? Where did it all go, does it just vanish? Now that I got that out of my system. As you can see, they are pushing the microchip in several different ways, and I’ll repeat again. I don’t care what they try to market to you, even if they tell you it’ll give you superpowers … because that’s our next step because of companies like Google. Do not allow your family or your friends to take the chip. Next, let’s look at the appealing commercials to teens and adults; let’s have an RFID party! Where everything you do is posted on Facebook with a simple flick of the wrist … or, hey, we go to this bar a lot let’s get a RFID chip implant so we don’t have to wait and can be VIPs – yeah! Oh, I really really wish I was joking. Because laziness knows no bounds, you can wear this wristband with a RFID chip and become indoctrinated – it’s OK, everyone is doing it! 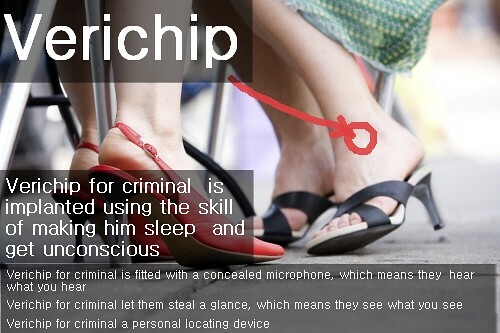 Chip yourself, it’s the new craze, it’s like getting a tattoo except it has a GPS tracking device. Because it’s not creepy at all that you become a human beacon for anyone who wants to track you, and oh no that could never ever be misused not just by the government but the civil population, i.e., hackers. It’s not like NSA recently got caught spying on everyone in the world? They would never ever be able to use the microchip to track you ever. Edward Snowden never revealed they tracked phones and smartphones. What makes you think RFID technology wouldn’t be abused and used to track people? Another example of insanity and RFID is Motorola; they have a patent for an electronic skin tattoo that basically tells whether you are lying or telling the truth that is applied to a user’s neck. So you can not only become a human beacon, but a human lie detector! Well hell no Moto, you can not chip me … try again. From putting the FUN into RFID courtesy of Facebook and Coca-Cola, there is my personal favorite: let’s all get chipped, drunk, and stupid – RFID nightclub. A few more examples then we will wrap up this anti-chip montage. Already a business has forced its employees to get a microchip to use their photocopier, open doors, etc. Seriously, a business forced people to get a microchip so they could work. My question is, what happens if they get fired? Are we living in The Twilight Zone? It feels like it. And they aren’t done pushing it, just imagine how an implant can allow you to wave your hand and open a door? Oh cool, so I can sort of be like Magneto? Trust me, they will push it in several more ways. We’ve already seen medical and commerce and fun, wait until you see the trans-humanist agenda out in full flesh. We will end with a hilarious YouTube parody by “Joy Camp” that needs to be seen by everyone capable of thinking for themselves. That’s the honest 100% truth. Let this one sink in real deep, in place of that RFID chip. The RFID Chip is always with you threatening your privacy causing severe risk to your health and personal safety and killing you if you don’t obey rogue government demands. Follow Activist Post on Minds, Steemit, SoMee, BitChute, Facebook and Twitter. Ready for solutions? Subscribe to our premium newsletter Counter Markets. That’s exactly how they do things when they want to undertake an enormously unpopular measure. First they’ll test the waters with a “trial balloon” or maybe some discussion in the media. Chances are it won’t be well-received, but it’s about introducing the idea. The next phase is emotional appeals (“for the children” and all the rest of it), declaring something to be a right (when it isn’t), or questioning it to death. After enough steamrollering, they eventually get their way, though sometimes it takes a court order for that. This microchipping thing is pretty similar to the “Number of the Beast” in the Book of Revelations. Therefore, in the USA (or any country with strong Christian beliefs) it will be hugely unpopular. If they tried to force everyone to get tagged like cattle, it would spark a revolution. However, Sweden is in a greatly debased condition, unfortunately, and it doesn’t surprise me that it’s starting there. Other than that, Sam Francis had a concept called “anarcho-tyranny”. This is the epitome of it.